Some of my wildest and reckless moments as a child was running across cement parking blocks at a pace that I somehow did not sustain significant injuries. Jumping from brick to brick, sometimes without even looking where I was leaping from as I tried my best to impress friends, family, or whoever was around. This is a random memory to bring back but one that kept coming up while playing through Light Fall, a platformer that requires precision, timing, and a little bit of recklessness. 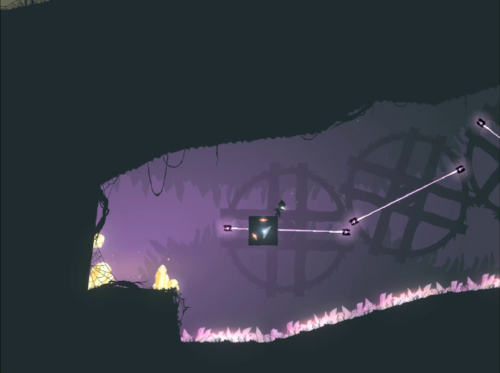 Light Fall has your standard qualifications for a platformer. Easy to learn controls? Check. Tough to make jumps? Check. Wall sliding and jumping? Also checked. The element that Bishop Games adds here is your character's unique ability, the use of the Shadow Core. Exploring Numbra can be dangerous and many times you'll find a gap or area that is too high or too far to reach by conventional means. This is where your Shadow Core comes into play. Pressing the jump button in the air will cause the box to appear under your feet, almost instantly. The box coordinates with your movements, whether you're just jumping vertically or on the fun, the Shadow Core will be there to provide a landing for your character. Even at full sprint, pulling out the Shadow Core gives you just enough time to land and make another jump. I cannot stress enough how important it is that this concept works as well as it does as there will be times during Light Fall that require you to master landing and leaping from your Shadow Core. With this in mind, platforming kind of has a do-it-yourself feel. Do you plan your jumps carefully with the environment in mind or sprint like a madman and use the Shadow Core as landing pads as you whiz through levels? Sure, there are sections where you're forced to go fast or take it nice and easy, using the core however you see fit gives you a bit of freedom to explore the levels. No longer is a ledge that looks out of reach truly "out of reach". Things are kept in check by having four charges on your core before you have to land on solid ground or a platform (walls don't count) to recharge. Perhaps the memory of my wannabe parkouring keeps coming back because Light Fall feels at its best when you're moving at full speed. There is a section in the first act that challenges you to use the skills you've learned so far to make it through a mini-gauntlet of sorts with a watery grave below your feet and some deadly objects that will stop you in your tracks. If this didn't sound challenging enough, you have to make it through this section with a tidal wave pursuing you. No problem, right? It is here that I am thankful for the game's frequent and convenient checkpoints. Much like Super Meat Boy, one hit and you're done. Checkpoints are for the most part placed right after a series of jumps or platforming sections. You'll thank the developers as some of these sections can take one, two, even a dozen tries. Even if you fail, you're right back into the action at the latest checkpoint, no time for a pee break. Light Fall isn't what I would consider a "very hard" game but it does punish you if you get too reckless. But remember what I said earlier about the game needing a little bit of recklessness to succeed? Running at full speed means less time to think and more time to react. While the camera does a good job of giving you a look at what is coming up ahead, moving fast brings those obstacles and hazards to you quickly forcing you to react. When you get caught in these moments where "hey, maybe I should have thought this out" comes to mind, it is best to just keep going, don't think and just react. Having the ability to pop the Shadow Core at your feet can be a lifesaver, turning what would have been an instant death anywhere else to a second chance to redeem yourself. That is if you react quickly and smartly enough. It is this thought and tactic that helped me through the mentioned area in act one. There is no time to wait so just pressing forward and reacting accordingly is a tactic that works surprisingly well. Hell, you might learn a new thing or two in the process. Repeating these moments may result in some frustration but making it through by the skin of your teeth is quite rewarding. Don't get flustered if/when you die, it will happen often. Many times the solution is right in front of you but just takes a few tries to get the method down. This is why Light Fall can feel challenging but not frustrating, its not a matter of what to do but rather how to do it correctly. On top of the normal running and jumping will be a healthy dose of wall jumping. You're given a very generous amount of time hanging on the wall before you start sliding down, which can play into some of the platforming in the later parts of the game. For the most part, this works quite well but getting out of the wall clinging animation is not easy. Your only option is to jump off as waiting to slide down would take way too long. It is a minor complaint about an otherwise good mechanic. A checkpoint and Stryx, likely very grumpy at this moment. Eventually, you'll make your way to the end of the stage and are presented with a cutscene telling more of the game's story. It is a fairly basic story, the hero not remembering who he is and must recover his memories, save friends, etc. The story doesn't really stick out for me personally, but that is more of a personal taste. The direction of the cutscenes and the narration are good and help with the overall presentation, I just didn't really connect with what was going on. It must be said that Stryx, the "get off my lawn" owl is funny and interesting as the game progresses. He provides clues and insight of what is going on while also berating the player for being reckless. As you get deeper into the journey, you'll learn more about Stryx and possibly the reasoning behind his behavior. The backstory is filled in with memory shards left by a figure known as Paddlewood. Hidden throughout the levels, these are still worth your time even if you really don't care about the story. If you want to obtain these memory shards, you're going to have to earn them as they nine times out of ten require you to go through a platforming sequence just to get to these shards. The catch here is you must then make your way back to a checkpoint in order to lock the memory shard. Substituting for side quests, finding and obtaining these hidden memory shards was quite fun and rewarding. Half of the fun was trying to get to them, with the other half figuring out how to make it back in one piece. Matching the mood of the game, the graphical style tends to be on the darker side. The graphics themselves are quite smooth with multiple layers of parallax backgrounds in some areas that offer a bit of depth to the world. As a world shrouded in darkness, Numbra looks and feels like a desolate place where you're not sure what to expect. Even with the darkness, hazards feel descriptively laid out as not to confuse what you can and cannot touch. In turn, the game runs smoothly without any slowdown to speak of. 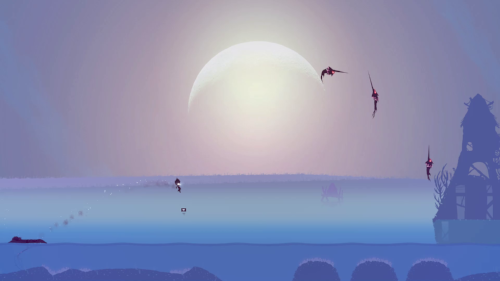 Light Fall does not reinvent the platforming genre, nor is it trying to. It puts a little twist on the genre with the Shadow Core mechanic and uses the mechanic wisely in both platforming and puzzle elements. You can finish the game in an afternoon which is about 3 to 4 hours, depending on if you go searching for hidden memories or villagers scattered throughout the levels. Think you can fly through the levels like butter? The speedrun mode is there to put your skills and timing to the test. Challenging but not controller-breaking difficult, where some platformers might "fall", Light Fall succeeds in being compelling from start to finish.